The remarkable career of the movie industry’s most admired and influential special-effects auteur, the legendary Ray Harryhausen, is the subject of Ray Harryhausen: Special Effects Titan. Leaving no doubt as to Harryhausen’s seminal influence on modern-day special effects, the documentary features enlightening and entertaining interviews with the man himself, Randy Cook, Peter Jackson, Nick Park, Phil Tippet, Terry Gilliam, Dennis Muren, John Landis, Guillermo Del Toro, James Cameron, Steven Spielberg and many more. These filmmakers pay tribute to the father of Stop Motion animation and films such as ‘The Beast From 20,000 Fathoms’, ‘It Came From Beneath The Sea’, ‘The 7th Voyage Of Sinbad’, ‘Mysterious Island’, ‘Jason And The Argonauts’ and ‘The Golden Voyage Of Sinbad’ – the films that enthralled them as children and inspired them to become filmmakers in their own right. felt before. These are the wonders of a world without words, viewed through man and nature’s own prisms of symmetry, savagery. chaos and harmony. 12 Interview outtakes with Jowe Dante, John Lasseter, Nick Park and more! 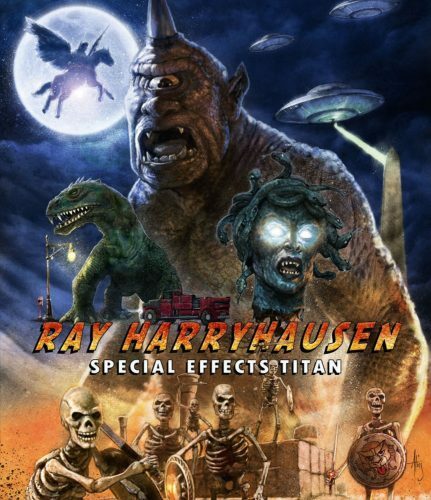 Ray Harryhausen: Special Effects Titan is a Documentary on the man Him self, one of the most inspirational and inspiring Special effects creator. Have you heard of Lord of the rings? Well yea that’s a movie with heavy inspiration to this guy. Arrow Videos first Standalone Documentary release here in the US that is not part of a featured film is here in Blu-Ray. I don’t do ratings for Audio and Video for Docu’s as the clips vary in every scene for every Documentary but here it looks good sounds good and of course you have older clips from the 60’s with film damage and what not but that’s apart of this as it’s with every docu. Pop this Blu-Ray in and get immersed in film magic from the start of Ray’s career. Who his Models have 100 times more detail and movements then today toys released for kids to play with. We are filled with a story that starts from his starting point on how he got into creating Special Effects down through the years of his work. We also get interviews and story’s of how inspired other film makers are when it comes to Ray Harrryhausen’s work. Also incorporated in this docu is all his films he applied the effects to down to how he did them at times which keeps this interesting with lots of clips from those films. We also get story’s on how other films are inspired by this guy and clips showcasing those dedications. We learn a lot, we are inspired when viewing, we are filled with excitement and wonder as how he did what he did at the time he started with nothing. When it comes to Documentary you cant get any better on the subject matter. This release is a must buy for any film maker, film viewer/collector who loves what happened behind the scenes. With that said I Give this Docu a 5 out of 5 and its a must have. It’s an Interesting, fun and entertaining view. One thing I hope grows from this is that Arrow will release more documentary like this and also films that are showcased here, classic creature films.